As a property manager, you are tasked with being knowledgeable and efficient when it comes to services and upgrades requisitioned for the building. Whether consulting in the decision making process or making the final call, it’s valuable to know the ins and outs of different building materials to ensure that you are making a smart investment for your business. As your trusted team of drywall contractors in Chicago, AZ Drywall Finishing knows about the importance of quality and precision when it comes to professional appearances. For years, our commercial drywall company as worked to deliver the highest level of care to each of our clients, extending quality through each of our services for long-term customer satisfaction. We proudly provide comprehensive results from metal stud framing to wall finishing and painting. We strive to provide comprehensive service, and part of our work involves answering questions on all aspects of our drywall services. Today, we’ll highlight the most commonly used thicknesses in drywall installation. Be sure to reach out to the AZ team for assistance if you are planning on remodels, additions, or new construction! While ¼ of an inch is readily available for residential and commercial applications, it is not used in normal applications. Quarter-inch drywall can be valuable for skimming applications, adding thickness when needed to double on the wall depth. Many drywall contractors will rely on quarter-inch for achieving favorable results with finer details. Aesthetic enhancements can go a long way, making this thin wallboard useful for a number of tasks. Curves, for example, can be hard to achieve with quality and consistency. Professionals and DIYers alike can use moisture to dampen the paper’s surface to allow for enough give to achieve a smooth curve. We recommend seeking out help from an experienced drywall company if your company is designing dynamic interior elements. If you can see drywall from where you’re sitting, chances are that it is ½ inch thick. Half-inch gypsum boards comprise roughly 90 percent of the standard home and more than half of the surfaces in commercial applications. This thickness provides the right balance of size, weight, and economy. Half-inch wallboards are relatively easy to carry and install while providing enough structure for commercial applications. If weight is a concern, drywall installation can be even faster and easier with light-weight panels that are ½ inch thick. You can expect each board to be more than ten pounds lighter, resulting in significant advantages for situations that require lighter outcomes. Three-eighths inch panels were once commonly used, but are quickly being replaced by the durability and versatility of modern half-inch drywall. You can still find three-eighth inch panels for use, but they are often reserved for repair projects. While ½ is a commonly used thickness, it is not ideal for certain applications. The ceiling is one area where a thinner gypsum board is never recommended. This is due to the long-term effects of gravity and sagging, an unsightly occurrence that can result in costly repairs. Many companies also rely on fire-resistant wallboard products to provide additional safety in areas that necessitate more stringent fire codes. Thicker options such as ⅝-inch board are ideal for fire resistance and general sturdiness, but can be impractical on a building-wide scale. Our drywall company can work with you to satisfy all fire standards in a cost-effective and beautiful manner. The thickness required for your project will depend on a range of factors, making it valuable to seek out professional assistance for a quality outcome that is done on time and on budget. 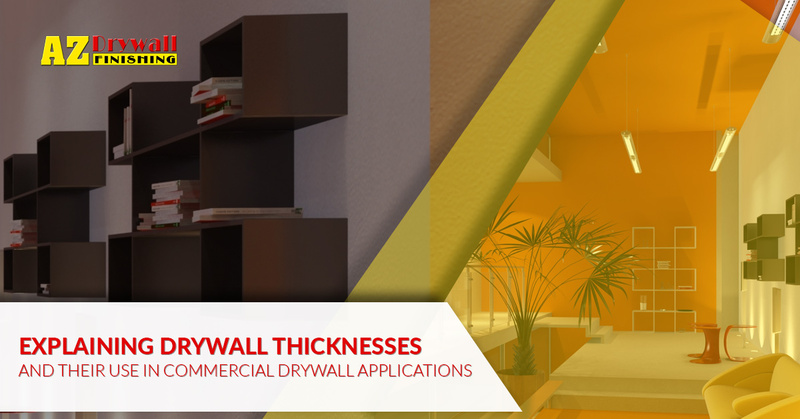 AZ Drywall Finishing is here to provide expert outcomes for a wide range of industry needs. Our commercial drywall contractors help Chicago businesses thrive with amazing results. Contact us today for your estimate!